Today is the one day out of the year that most Americans expect a knock at their door, and a savvy organization called Trick or Vote is capitalizing on that. Trick or Vote canvassers will be going door to door tonight, dressed in spooky costumes, but rather than asking for candy they'll be asking for citizens to get out and vote on November 4th. Who is Trick or Vote trying to reach with these videos? "We use the undead to encourage the living to vote," said Matt Singer, lead organizer for Trick or Vote. "The sad truth is that zombies, vampires, werewolves, and monsters are all disenfranchised still in this country, so the best way for them to have an impact is by encouraging living humans to vote. We prioritize talking to young people and other people new to the process." Haunted by the idea of low voter turnout? Visit www.trickorvote.org to sign up. Obama blitzes primetime with a 30-minute special, celebs left and right get even more political, and students from Ron Clark Academy turn a popular rap song into a political anthem. Here’s this week’s Friday Five. Obama’s 30-minute ad that recently ran on primetime TV. Stephen Baldwin, Victoria Jackson, and other celebs star in this ad targeted at Minnesota Senate candidate Al Franken. DiCaprio and a parade of Hollywood all-stars encourage you to vote. Chuck Norris’s urges voters not to forget their Second Amendment rights come election day. Students from Ron Clark Academy have a simple (and catchy) message for potential voters. CEOs of some of the biggest companies in the country are banding together to encourage their employees to take an hour off from work to vote on November 4. The Vote Hour project was developed after a Google employee learned that the number one reason registered voters did not vote in the 2004 election was not being able to escape from work for long enough to cast a ballot. The concerned citizen proposed the idea to Eric Schmidt, CEO of Google, who agreed to create a video urging all Google employees in the U.S. to take a "vote hour" on November 4 to leave the office and head to the polls. CEOs from other companies like Cisco, General Motors, Time Warner, and Intel (even Donald Trump!) have thrown their support behind the project and are recruiting other business leaders from around the country to join in and make a video permitting their employees to schedule a "vote hour" on Election Day. If you're a CEO who wants to participate, click here. If you want to let your boss know about this project, click here. And most importantly, go vote on November 4! Most primary challengers have long since shuttered their YouTube channels since the General Election began. Mike Huckabee hasn't logged into his account in 6 months. For Fred Thompson, it's been 4 months. John Edwards and Mitt Romney haven't been on the Tube in over a month. There are some exceptions - Ron Paul and Dennis Kucinich have stuck around, trying to capitalize on the movements their campaigns created - probably because that's more of what they were about from the start. But the most interesting exception is Hillary Clinton - the campaign has continued to post videos of her campaign stops, her time at the Conventions, and some behind-the-scenes material, too. Her latest is a joint "Get out the Vote" video with President Clinton. It looks like not many are watching however - this clip only has 329 views in 2 days. It used to be that a Clinton video uploaded to YouTube was guaranteed to get at least 20,000 views, if not many times more. But of course things have changed drastically since then, with the Obama campaign dominating the Democratic viewership on YouTube - just yesterday the campaign uploaded 20 - yes, 20! - videos to their YouTube channel in one day. Why would anyone want to stop you from voting? Video the Vote is a nonprofit organization that employs a network of citizen journalists to capture polling place problems on Election Day. The organization works on both an assignment desk and platform model: people can submit videos to their website, and Video the Vote also contacts individuals in their network and dispatches them to document troubles as they arise in precincts across the country. Already, they are documenting issues in machine technology glitches, and are seeing long lines at several polling places. Our Election Day partnership with PBS, Video Your Vote, seeks to encourage, aggregate and spotlight this type of content from groups like Video the Vote across the country. We're working with several Election Protection partners both to highlight issues in election fraud but also to encourage voters to document their voting experience no matter what the result. This will be the most-documented election in history, and we encourage people to submit their videos to our Video Your Vote channel on YouTube, at youtube.com/videoyourvote. It's around this time every Election Season - in the final days leading up to the vote - when Americans across the country turn to their local and national newspapers to find issue-by-issue comparisons of the candidates. It's as if newspapers sit down to do these comparisons - which read like campaign cliff notes - out of a final sense of responsibility to cover the issues instead of the horse race. Though they often read like text books, they're incredibly helpful as a final study before voting - especially if you haven't made up your mind. This year, a group of Harvard students is taking a new approach to issue comparisons with a project called "Vote Gopher". With the catchy tagline, "We dig, you decide," Vote Gopher digs up candidate positions on the issues and compares them in a series of short YouTube videos they produce. Complete with clips from candidate videos, easy-to-understand bullet points and graphics, and clear, well-researched narratives, these videos are a great study to those who'd rather cover the issues via video than newsprint. Here's a great example of a Vote Gopher video, on healthcare. You can learn more and watch more issue videos at their YouTube channel or at their website, www.votegopher.com. McCain's latest ad questions Obama's readiness, Biden loses his patience with a TV interviewer, the “Wassup” Guys return, Palin gets the Dr. Seuss treatment, and a spokesperson for "Rock the Vote" wants to make sure you also protect it. Here’s this week’s Monday Hotlist. What a difference a few months make...or a few years. Meanwhile, it appears the McCain Girls have had a change of heart. They’re now Obama’s Mamas, and these days they’re singing a different tune. Got a question for Nancy Pelosi? Submit it here. The Speaker of the House is visiting the Google Headquarters on Monday, October 27th - and we have the opportunity to interview her with questions that voters submit here on YouTube. Submit your question for the Speaker as a reply video or comment to the video below. Average "Joes" stump for McCain, conservatives (and some famous Jewish comedians) come out for Obama, Team Nader gives us a good pre-Election scare, and a fake boyband gives new meaning to the word "battleground." Here's this week's Friday Five. Inspired by Joe the Plumber, McCain supporters avow their solidarity. Conservatives explain why they’re voting for Barack Obama. Pro-Obama “boyband” parody targeted at an important voting demographic. Older Jewish celebrities come out for Obama. Latest ad from the Nader campaign. In case you didn’t know, come February 17th 2009 all televised programming in the U.S. will be broadcast exclusively in digital. And with less than four months before the deadline, millions of Americans have yet to make the transition. To ensure that they do, the Consumer Electronics Association (CEA) is launching the “Digital TV: Convert Now!” contest on YouTube. The contest calls upon on the creativity and imagination of the YouTube community to spread the word about the pending digital transition. Users are being asked to make a video, no longer than three minutes, that demonstrates what people need to do to make the transition and simplifies the steps they need to take. The contest launches this week and will run until December 10th, 2008. Full contest entry details can be found at www.youtube.com/dtvtransition. The McCain campaign's "I am Joe" contest is off to quite a start - though the deadline for submissions to the contest isn't for another day, already the campaign has released a mash-up of the submissions they've received so far. The winner of the contest, who creates the best video explaining why they are "Joe the Plumber" will see their video made into a television ad for the campaign. Smart move by Team McCain. In recent weeks, and especially in the wake of the presidential debates, attention has focused back on the war in Afghanistan. Hoping to fill the void in the media coverage of Afghanistan, VBSdotTV's YouTube Channel has launched a six-part Internet documentary this month entitled “Inside Afghanistan with Ben Anderson,” an in-depth look at “the other war” in the war on terror. From harrowing ambushes and intense fighting, to candid moments with soldiers doing their best to retain their humanity, Anderson’s documentary sheds a much needed light on a war that all too often doesn’t get the media coverage it deserves. Don't forget to document your voting experience on camera both before and on Election Day, and submit your videos to the Video Your Vote channel; a selection of the videos received will be featured on PBS during its election coverage. And, make sure to watch this legal primer, provided by the Citizen Media Law Project, before bringing your video camera to the polls. It now looks like Joe the Plumber, the now-famous Ohio resident who challenged Senator Obama on his tax plan and was catapulted onto the national stage during last week's presidential debate when both candidates referenced him a combined 26 times, will remain in the spotlight just a little bit longer. 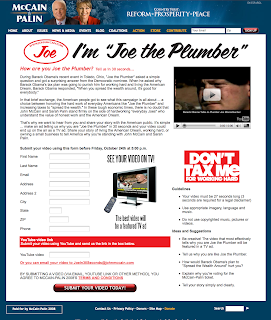 This morning the McCain campaign launched an, "I'm Joe the Plumber" video contest. The contest asks McCain-Palin supporters to create 30 second videos about how they are like Joe the Plumber, by sharing their stories of, "living the American Dream, working hard, or owning a small business." The campaign will run the winning video as a television ad. A recent Suffolk University poll shows that the "Joe the Plumber" storyline isn't resonating as strongly with voters as the McCain campaign might hope. Perhaps this contest will help citizens identify more with Joe, or help the campaign find a symbol that the American public finds more relatable. Susie the Nurse, are you out there? Your chance at fame is just an upload away. 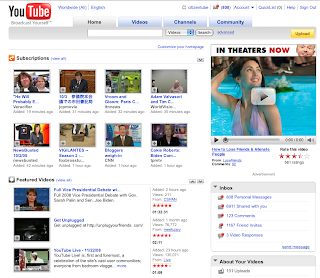 Colin Powell endorses Obama, the RNC goes after the Dems, Obama Girl does Palin, and Citizen Steve videos his vote. (Plus, more fun with Joe the Plumber!) Here's this week's Monday Hotlist. McCain, Obama, the stars of Gossip Girl, John Cleese, Tyra Banks, and a guy named Joe...they all make an appearance in this week's Friday Five. Last night's presidential debate, the final in the series sponsored by the Commission on Presidential Debates, wrapped up this cycle's general election debates without making use of the Internet to engage voters in the process. The Commission did make an attempt to utilize online tools this year, but that attempt fell flat. Last week's presidential debate, hosted by Tom Brokaw, used a "town hall" debate format that was designed to let voters ask the questions of the candidates - in person, and online. However, it was Brokaw who decided which hand-picked town hall questions to point to, and which "Internet questions" to ask. Of the tens of thousands that were submitted online, Brokaw selected just four. It's hard to see what influence, if any, voters actually had on this debate. And so this general election cycle has passed without citizens ever having the chance to truly inform the dialogue in the most important of our public forums - presidential debates. That's a shame, because this year we've seen the Internet offer us new opportunities to tap into the issues that matter most to voters. The role of the Internet in this election has been well documented in this blog and countless others - not only has the web changed the way that candidates raise money, but online platforms and tools like the ones we've developed at YouTube are actually changing the national discussion over politics and policy, re-shaping the media ecosystem to allow voters to have more power, and more access to critical election information, than ever before. It's only natural to leverage these tools to connect candidates and voters directly during debates. That the debate moderator has broad discretion to ask follow-up questions after a candidate’s answers. That Internet questions voted on by the public in the fashion that Google Moderator has provided be used to drive the dialogue in debates. That all footage of debate be released into the public domain so that anyone can post, mash-up, and re-purpose them to increase the audience for our most important public events. And that an alternative to the CPD is created, to create a more transparent and accountable series of public debates. During the primary season, we partnered with CNN to use the power and reach of YouTube to create a more democratic debate. Voters could submit questions on YouTube, which were then posed to the presidential candidate in two primary election debates. And this fall, our You Choose '08 Spotlight series has allowed voters to ask questions of candidates in hot Senatorial and Gubernatorial races - and compare both candidates answers - here on YouTube. But these innovations are just the tip of the iceberg in terms of increasing civic participation in debates - there's a lot more we could do to insure that voter's voices inform our national discussion. Google Moderator, the tool that the Open Debate Coalition refers to, allows voters to submit questions via text or video, and to vote up or down on all questions submitted. The wisdom of crowds comes into play as people bubble up questions they think are most important, and vote down questions they think are less relevant or inappropriate. The platform is based of the same system we use internally at Google to ask questions of our founders at each week's company meeting, and it is built by engineers who control for issues like spamming, profanity, and duplication. A few months ago we asked both candidates to come to New Orleans to take questions from voters using this tool. However, the debate didn't come to fruition. We believe it was a missed opportunity to let the concerns of voters, expressed on the most democratic of political mediums - the Internet - inform the debate over the future of the country. The missed opportunities of this year's debate series gives us the opportunity to re-consider how we construct our presidential debates. We support the work of the Open Debate Coalition and will continue to push for public forums that make use of technology to engage more people in politics and public policy than ever before. In our latest You Choose ’08 Spotlight, we turn to New Hampshire as Republican Senator John Sununu and Democratic challenger Jean Shaheen answer questions from YouTube users. Watch as they discuss social security, “green” jobs, heath care (see below), and other issues that matter to you. Check out www.youtube.com/youchoose08 to see more. Less than four weeks from today, one of the most exciting presidential campaigns in history will come to head, and millions of voters from every state in the nation will set out for the polls to cast their ballots. On November 4, we invite you to document your experiences on Election Day and share them with the world here on YouTube. Today, in partnership with PBS, YouTube presents Video Your Vote, a project designed to shed light on voting in America and show democracy in action through the eyes of voters like you. Together, PBS and YouTube ask you to share videos of what you experience on Election Day. We're looking for perspectives from polling places across the country that chronicle the excitement and energy at the polls, as well as any problems that may arise -- like long lines or broken voting machines -- that could prevent citizens from exercising their right to vote. Some of the best videos uploaded to the Video Your Vote channel will be showcased on PBS throughout the station's election coverage. Be sure to tag all of your election day videos with the tag "videoyourvote" -- and if you witness or encounter anything problematic at the polls that is hindering the voting process, add the tag "pollproblem" so your video can be easily found. From now until Election Day, Video Your Vote will be your go-to destination to learn all about voting. Here you'll find interviews with the world's most knowledgeable election experts, in-depth reports on this year's election and elections past, and creative "Get Out the Vote" videos from some of YouTube's champions of democracy. Ready to see first-hand how the people get to have their say in the political process? It's time to jump in and Video Your Vote. The 90 minute debate was televised nationally on TV ONE at 7pm Oct 14th and was particularly lively, with both leaders often yelling over the top of each other. At one point Helen Clark stated "I am telling you John. You might be used to shouting people down at home, you are not shouting me down." Sounds like the kind of thing I used to hear from my parents as a cheeky teenager. It was a fantastic evening and great to be able to contrast the two leaders and their policies across such a vast array of topics. All clips from the debate can be seen here on the debate channel. We were even fortunate enough to catch up with Helen Clark for a photo before she left the studios. We were searching for John Key to do the same but appeared we were too slow as he had already departed the building. Nonetheless, I want to thank the two leaders for a fascinating debate, TVNZ for doing such a great telecast and importantly our YouTube users in New Zealand, who not only submitted such great questions but also voted, commented or just simply tuned in to hear the respective leaders answering important questions from the people. Hoping this is only the beginning as we see New Zealand's political parties embrace YouTube more as a way to engage with the electorate as the campaigning unfolds. Obama and McCain go at it, Palin gets booed at a hockey game, an in-depth interview with a McCain supporter, and a political music video inspired by Kanye West. Here's this week's Monday Hotlist. In the several-week-old tradition of Sarah Silverman's popular Get Out the Vote video, The Great Schlep, the Obama camp is hoping to rally young people to convince their elders to vote (for Obama). In this video from the campaign, a handful of young people not yet old enough to vote, talk about how and why they decided to have "the talk" with their parents and other family members about who to vote for in the upcoming election. You know the Obama team has plenty of money if it can afford to spend dollars targeting a population that won't even be able to cast a ballot on November 4, but it's a smart way to leverage the enthusiasm and support Obama has drummed up within the American youth. A week of debate, reaction, and emotion. Here’s this week’s Friday Five. You asked, they answered. 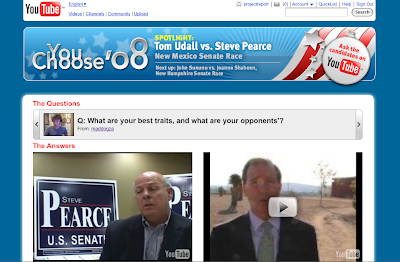 In our latest match-up of our You Choose Spotlight series, New Mexico Senate candidates Tom Udall (D) and Steve Pearce (R) answer questions submitted by YouTube users. Watch what they have to say about education, green jobs, the economy, and other issues by going to www.youtube.com/youchoose08. Last nights supposed "town hall" style debate fell far short of what a truly people-powered debate could look like. With questions coming from hand-picked audience members - and just 4 questions coming from the Internet - there was a huge missed opportunity here to engage more voters directly with the candidates. "The second departure from past CPD formats will be the introduction of internet access to the presidential town meeting debate," the Commission stated in a press release. "Questions solicited by Internet will be included with those from citizens on the stage with the candidates... The Commission believes that by including questions from Internet participants, we will enhance and expand the effectiveness of the town meeting debate. This technique has been employed in different ways during many of the primary debates. We will continue to learn from its use in the primary season, and we intend to consult with experts in information technology who can help us integrate it." The Commission, to their credit, did work with MySpace to develop MyDebates.org - a site where people could submit questions for Tom Brokaw's review. The site also has some nice polling functionality and allows you to toggle through the debate footage by issue. While these are features that most platforms already provide (ours included), MyDebates.org did present a nice interface to engage with the content. But it was not a way to influence the actual debate itself, and let citizens drive the questioning. It's impossible to imagine the Brokaw and his staff could actually look at the thousands of questions submitted and surmise which were most prevalently on the mind of voters. For that to happen, you need to tap into the wisdom of crowds. As we've mentioned here before, Our friends at Google have done just that with a new platform called, "Google Moderator". The platform allows you to submit a question for the candidates, and vote on the ones you like most. Bad questions, spammed questions, and other inappropriate material gets surpressed by the most active users, and the most prevalent questions rise to the top of several different issue buckets. We started a version of Moderator for the debates that you can see here. This is the kind of format that truly taps into the power of the Internet to insure the questions most on the minds of voters reach the candidates in a debate. Jose Vargas points that out in his column in today's Washington Post. However - just because it didn't happen in the live debate, doesn't mean the candidates can't still answer the top questions via Google Moderator - and post those answers to their YouTube channel. In fact, one candidate already has: Bob Barr. See below his YouTube video response to the top questions on Moderator. Would be great to see the McCain and Obama campaigns follow suit. As we've said before, our CNN/YouTube Debates had a format that pushed the role of the citizen forward - and there is still a long way to go and lots of opportunities to engage more voters in our most important public forums. To learn more from a bipartisan group that's doing great work in this area is the Open Debate Coalition -- see their website here. In preparation for tonight's town hall debate -- the second of three between presidential candidates John McCain and Barack Obama -- the Democrats are trying to raise expectations for McCain's debate performance sky-high, arguing that the town hall format has always been Senator McCain's strong suit. The DemRapidResponse YouTube channel, which is run by the Democratic National Committee, released an advertisement today that mashes-up dozens of news clips of media pundits, journalists, and even the candidate himself, declaring that the folksy, direct approach of the town hall meetings allows McCain to shine. High expectations for McCain raise the bar to his success, but the Senator's performance in Town halls is legendary - he's done over 100 so far, and repeatedly asked Senator Obama to join him in townhalls all summer long. See for yourself tonight, when the two candidates go head to head in Nashville, Tennesee at 9 pm ET. The entire debate will also be available here on YouTube on the C-SPAN channel after the live taping. ...and the Obama campaign, seemingly making up for lost time, just launched a documentary on McCain's involvement in the Keating 5 back in the early 80s. Keep your head down - the cross fire is going to pick up even more. Team McCain goes after Biden, a union leader give a passionate speech on Obama and racism, Jessica Alba gets political, and a singer-songwriter humorously vents his political frustration. Here’s this week’s Monday Hotlist. Ever wonder how the debate over whether or not the candidates would meet directly with foreign dictators got started? Well, it got started by a YouTuber - Stephen Sixta. Back in the Democratic primary CNN/YouTube debate, Sixta asked the candidates if they would meet "seperately, without pre-condition, during the first year of your adminsration... with the leaders of Iran, Syria, Venezuela, and North Korea?" Obama answered "Yes", and when Anderson Cooper asked Sixta to respond, he said he wanted to hear from Senator Clinton - who said that she would not. Register To Vote: Deadlines looming! The U.S. presidential election is just over a month away, but you won't be able to exercise your right to vote on November 4 unless you've first registered to vote. And those deadlines are approaching fast - in many states, the deadline is next Monday, October 6. How do you find out where to register? Google has created a great maps platform into which you can type in your home address and get information on where to register in your state - you can find it at maps.google.com/vote. If you want to learn more about this easy-to-use platform, see this video made by our friends at Google, which we're currently featuring on the Worldwide homepage. We're also featuring two more voter registration videos -- one was shot by Leonardo DiCaprio and friends, especially for the Google Maps platform launch, and the second comes from YouTube's own Citizen Kate, who participated in the "Voter Vlog Tag" project, a YouTube community project started by JoeFelice that aims to get YouTubers to tag each other with the task of getting their friends to register to vote. Keep your eyes peeled for the creative ways YouTube users are utilizing the site to encourage you to vote, and make sure to get out and register NOW on Google's new platform! And as always, stay on top of the latest election news directly from the candidates on our You Choose '08 platform. Biden and Palin go head to head, Leonardo DiCaprio and friends have a message for unregistered voters, citizens protest against the proposed bailout, and Diddy tells us why he's afraid. Check out this week's Friday Five. Full coverage of the first--and only--VP debate between Biden and Palin. Leo DiCaprio and friends urge people to register to vote. Protesters voice their disapproval of the proposed Wall Street bailout. Diddy tells us why he's afraid of Sarah Palin. A young vlogger voices his discontent with the two-party system. Political content on YouTube has truly reached a fever pitch. And at no other time is this more significant than in the hours leading up to, during, and after the presidential debates. That's why we're working with CSPAN to put all of the debates on our homepage, so that voters can see the entire debate on YouTube. And the YouTube community is responding well - last week, the first presidential debate got over 880,000 views and a 4.5-star rating. While we usually are very careful about posting political videos on our homepage - we take very special care to insure we are non-partisan - presidential debates are unique opportunity to help voters of all politcal persuasions discover and engage with political content from both candidates, and decide for themselves which canididate they prefer. The Berkman Center for Internet and Society just released a report on the role that technology played in the violence in Kenya earlier this year. We reported in January how YouTube was used to document the post-election riots in Kenya, when the nation's public broadcaster used their YouTube channel to share the startling images of violence with the rest of the world. The Berkman study looked at how SMS and other grassroots technologies were used for good and for bad - and examined how the catalyzing nature of many-to-many communication has its benefits and its pitfalls. In particular, the case study - authored by Joshua Goldstein and Juliana Rotich - examines how some Kenyans used mobile technology to motivate thousands of people to take to the streets in violence. Fast communication meant for quicker escalation to the violence. On the flip side, the authors note, activists and bloggers also used such tools as Google Earth and maps to document the violence and showcase the problems to the rest of the world (in the same way NTV used YouTube). The paper is worth a read - you can find it here. 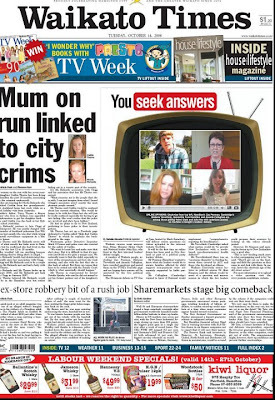 The paper may cause some to lament how technology has made mob violence a more orchestrated, more effective social ill. But it also highlights the needs of governments to be on top of technology as well. In the Kenyan case, the government asked Safaricom, the nations largest mobile provider, to consider shutting down the service. Michael Joseph, CEO of the company, had a better answer - he sent out a message to every single customer on his network, urging peace and calm.